It is with great sadness that we note the recent passing of Michael Owen VK3KI. Most readers would be aware of both the work done by Michael on the local amateur scene. In my view, Michael has been a key influence in our hobby over the past 10 years. Prior to that time, I was not really aware of his roles, but have been educated by reading the many tributes that have been published on the web. It is clear that Michael also performed important roles at the international level. It was actions of Michael Owen that resulted in me being approached to become Editor about seven years ago. Once I accepted the position, the Publications Committee and I have received full support from Michael. He was a regular attendee at our Publications Committee meetings and would freely share his thoughts and offer guidance. Above all, he allowed us to make our own decisions. Of course, his guidance occasionally caused minor changes in direction, but all members of the committee were happy with all decisions reached. On behalf of the Publications Committee, I publicly extend our condolences to Nanette and family. I will be endeavouring to source appropriate material for a tribute to Michael for publication in the next issue of Amateur Radio. We have a brief tribute this month, within the President’s Comment. We have also published a number of photographs of Michael on the Inside Back Cover of this issue. The Callbook is currently in the final stages of production, running a little behind schedule. It should be available shortly, if not yet in stock at the WIA Bookshop. Readers are reminded that the 2013 edition will include all issues of AR from 2011 in electronic format at no extra charge. It will also include the NZART Callbook in electronic format. The Callbook Editor has advised that he will not be available to continue this role in 2013. The Publications Committee is therefore seeking expressions of interest from anyone who may be interested in taking up this volunteer task. The main role of the Callbook Editor is to source appropriate material and updates of content for inclusion in the Callbook, including suitable images for the cover. Feel free to contact me in the first instance if you are interested in the role. Some readers will be aware of the Summits On The Air (SOTA) program, which started some 10 years ago in the UK. SOTA finally started in Australia in February this year, with the Victorian association becoming live on the SOTA system. The South Australia association was approved by the SOTA Management Team (MT) and became live on 1 October. The ACT association is close to having all of its paperwork approved and it is anticipated that VK1 will become live in the near future. Interest has also been expressed in VK2, VK6 and VK7, with a small group of amateurs in VK2 working to identify qualifying peaks in their local region as part of the overall task of documentation required by the MT. The rules of SOTA require that a peak must be officially listed with SOTA before a peak will earn the activation points for the summit. Peaks are given a points value based on the summit height above sea level, using bands of heights – broadly, the higher the peak, the higher the points, to a maximum of 10 points. An activator must work at least four different stations to qualify for the summit points, but each contact (chaser) only needs a single contact with an activator to gain the points. We have seen lots of behind the scenes activity over the past month or two as the teams have worked on preparing the documentation to establish SOTA associations in some states. The generally improving weather in Victoria has also seen an increase in activation attempts. This flurry of activation activity has not simply been due to the improving weather – several activators have been attempting to activate high points value summits before the end of the winter bonus on 14 October. For peaks with points value of 8 or 10 points, an activator gains a seasonal bonus of three points if the activation occurs during the period 15 June to 14 October for the VK3 association. At the time of preparing this Editorial, three amateurs in VK3 have gained over 100 points – the first level of the awards scheme, which means that the activator can apply for a certificate. The first main award is the Mountain Goat Award, which needs 1000 points from summits activated. Wayne VK3WAM is currently leading the charge for activators. He is currently approaching the 250 point certificate level. Chasers can also accumulate points towards the SOTA awards. The recognition levels are 100, 250, 500 points. Once a chaser reaches 100 points, they qualify for the Shack Sloth Award. In Europe, some chasers have very high totals – the top chaser has over 69000 points! Having been active as a chaser for 10 years helps, I am sure. Good luck to those working on the documentation to establish new associations. For everyone else, you can help by listening out and working the activators, who must make the final ascent to the summit activation zone by non-motorised means, carrying their radio gear with them. This requirement means that most operations are QRP. Personally, I feel much more satisfied if I have several stations in the log after climbing a summit, rather than just the minimum of four to qualify the summit! I will attempt to organise a more detailed article on SOTA for a future issue. My understanding is that SOTA has some parallels with IOTA, which has a strong following. It is another challenge for amateurs. In my case, it forms a stimulus to be more active both physically and on radio, combined with being in the great outdoors. Hopefully I can work you from a summit in the near future. Michael Owen VK3KI in contact with ARRL President Kay Craigie N3KN during the last QSO using the VK100WIA special callsign in 2010. Photo by Robert Broomhead VK3DN. It seems rather surreal writing this President’s Comment because I never expected to be in this position, but in accordance with the WIA Constitution, and following the tragic and unexpected loss of Michael Owen VK3KI, here I am, with Chris Platt VK5CP as Vice-President. I think we can all be certain that there will never be another Michael Owen. His dedication to amateur radio, like most things in Michael’s life, is legendary. Michael, along with the late Chris Jones VK2ZDD, devised a new structure for the WIA early last decade which fundamentally changed the organisation from a Federal Structure with indirect grass-roots membership through State Divisions to a more effective National Structure with direct membership and affiliated local clubs. One of the prime roles of the WIA as the peak body representing Australian radio amateurs is to liaise and negotiate with the regulatory authority, the ACMA. This Michael did masterfully. Bringing all the skills of an experienced corporate lawyer, Michael negotiated the introduction of a new Licence Conditions Determination (LCD), reducing the number of licence grades from five to two, abolishing the Morse code requirement, and removing some restrictions relating to 3rd party traffic and emergency operation. I have never seen anybody work a room quite like Michael, one way or another managing to get everyone to agree with him, akin to getting six cats into a bucket of water. That’s pretty much how I became a Director of the WIA and later Vice-President, and how many people became WIA members at field days - we all simply gave-in to overwhelming persuasion! Michael also championed the development of the WIA’s Examination and Callsign Management Service and the introduction of the Foundation licence, a move which encouraged many new entrants into the hobby, many of them young, and bolstered the numbers of Australian radio amateurs while in other countries numbers were declining. Amateur radio societies around the world also benefited from Michael’s enthusiasm and experience. Michael was passionately involved in the IARU since his early days which trace back to the 1960s. Internationally, he is perhaps best remembered for his work on Article 25 at WRC-03 where a package of revisions to the International Radio Regulations were introduced that are specific to the Amateur and Amateur-Satellite Services. I was only speaking to him a few days ago and he was very enthused about leading the IARU Region 3 Conference in Ho Chi Minh City in a few weeks. Michael was a good friend and mentor to many of us in IARU. His drafting skills were second to none, and his ability to clearly articulate his position on a number of issues was of immeasurable help to us. The IARU is indebted to his work at WRCs and at many regional Asia Pacific Telecommunications (APT) meetings. IARU President Noel Eaton VE3CJ had called the first-ever meeting of representatives from all three IARU regions to coordinate global preparations for the 1979 World Administrative Radio Conference. WARC-79 is memorable primarily because it’s where the Amateur Radio Service gained the bands at 10, 18 and 24 MHz, among other things. Among the assignments that Michael drew at WARC-79 was to draft a resolution to exempt the Amateur-Satellite Service from coordination procedures that otherwise would have bogged us down in endless paperwork and great expense. As an attorney it was just the sort of thing he was good at. His work has stood the test of time, and it remains in effect to this day. Michael then went on to serve as Vice President of the IARU from 1989 – 1999 while he was living in London, President of the WIA from 2003, and as Chairman of IARU Region 3 since 2006. Michael Owen was a strategic thinker; he saw past short-term pros and cons and could envision how decisions made today would affect the distant future. He also understood that working in the background – doing one’s homework – was essential to success. There is simply no way to replace someone with Michael’s experience and wisdom. His death is a searing loss for both the IARU and the WIA, but both organizations are stronger today because of the enormous contributions he made to their well-being. So, although I’m experienced with complex organisations, you can see why I’m feeling a little apprehensive. Michael was a good friend and a tireless worker for amateur radio and impossible to emulate. 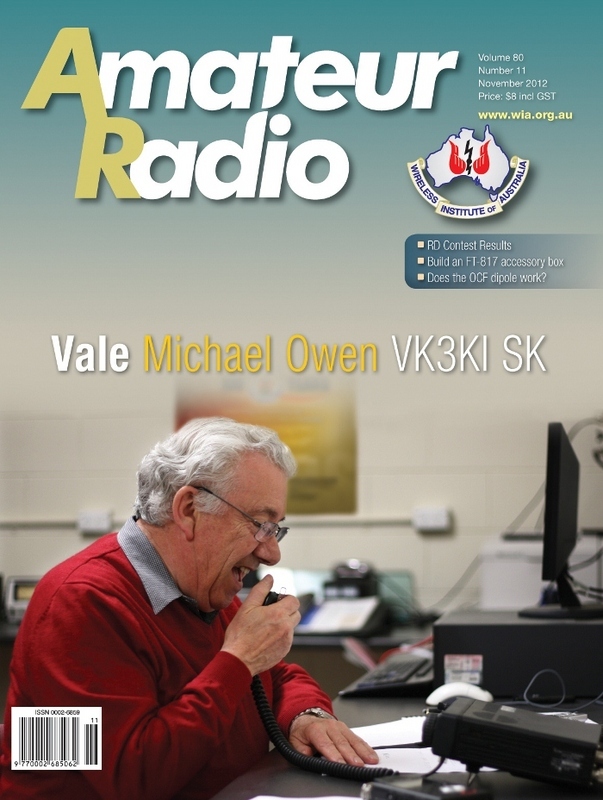 In many ways this is a watershed moment for amateur radio in Australia. Clearly there are significant challenges ahead, some related to Michael’s passing, some not, and we need to think about how the WIA should progress in the post-Owen era. Some things, like our relationship with ACMA and our advocacy work, are strong and robust; others like our communication with clubs and individual members, our need to rein-in escalating costs, and our urgent need to lower the work-load on a few volunteers are all things we need to consider over the coming months. As such, I would particularly like to use this President’s Comment space to address some of those issues in future editions of AR, and solicit your responses. On behalf of the Board and all WIA members, at the reception following Michael’s funeral I expressed our deepest condolences to Michael’s family and friends. Over the next few months the Board of the WIA will be considering how we can best remember the legacy of Michael J. Owen. This is a short article that describes a rather severe windstorm that went through the author’s property in the South Australian Riverland area, on its way doing significant damage to many buildings and other equipment as well as the local flora, with many hundreds of trees being either totally destroyed or badly damaged. The moral of the story, however, is the author’s practice of ‘over-engineering’ his antenna structures in preparation for a ‘worst case’ scenario someday visiting him. Which, one day, it did. And, because of the care and attention to detail in construction, the antennas survived. The results of the Remembrance Day 2012 contest are published, together with the contest manager’s summary of the event. For contesters, this makes interesting reading. For non-contesters, perhaps this report may be a spur to induce participation in 2013. The FT-817 has found great favour with amateur operators, whether they use the HF, VHF or UHF bands. Although it is a low powered unit, it is very versatile and extremely reliable, and lends itself to many applications, among them extended use in the field. In this article, the author explains how he designed and fabricated an accessory box that significantly improves the flexibility and reliability of the FT-817, and his solution will find great interest among those many FT-817 readers among the readership as a practical, totally worthwhile addition. This article analyses a typical multi band Off Centre Fed (OCF) dipole antenna as is found in many amateur applications. It particularly tries to identify and explain the losses sustained in such antennas, which are often ‘hidden’ from the operator and often the reason why theoretical and practical (or actual) performances in OCF and similar antennas differ so widely.